You are invited to join the Sunday afternoon clinics and free play being held on the lawn of the Mennonite Heritage Center, 565 Yoder Rd., Harleysville from 2 to 4 pm. There is no charge. 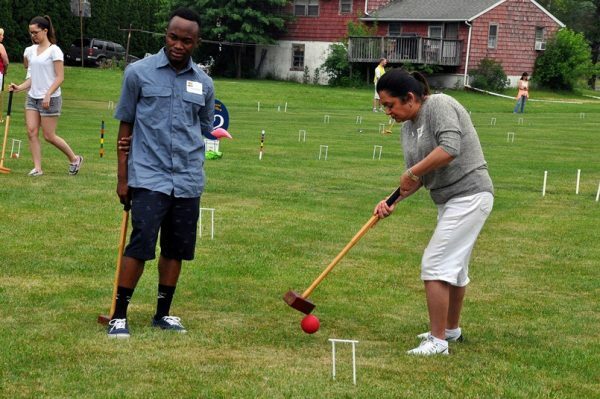 *Survivor Croquet Clinics for youth groups are held on an as-request basis. 5:00 pm Survivor Teams sign in begins *All teams to be checked in by 5:40 pm. 7:15-8:00 am Team Sign in for all players (both players of a team sign in together). *All teams to be checked in by 8:00 am. Our celebration and “thank you” to Whack & Roll sponsors. Semi Final (9 Teams) rounds and Championship round (3 Teams) will be one hour. Novice Division Afternoon Championship (3 teams) round will be 1 hour.